Jacopo Tintoretto (c 1518-1594), The Last Supper (E&I 162) (1574-75), oil on canvas, 228 x 535 cm, San Polo (Chiesa di San Paolo Apostolo), Venice, Italy. Wikimedia Commons. From about 1570 onwards, Jacopo Tintoretto was attracting enough work into his studio that much of it had to be carried out by his staff and apprentices. Among them were some of his own children: he had married the daughter of a noble (who was helpfully the guardian grande of the Scuola Grande di San Marco) in 1550, and his daughter Marietta became an accomplished portrait painter. His son Domenico is thought to have become increasingly responsible for paintings from the studio from this time onwards. As neither painter signed their work, these are conclusions drawn from the study of the features and style of paintings attributed to Jacopo and his studio, and rely on Jacopo’s work being visibly superior to that of his son Domenico. They also account for the wide variation in quality between different works thought to be ‘Tintorettos’. In these articles, I concentrate on paintings in which Jacopo is thought to have been the primary creator, even though in many cases much of the execution may have been left to his studio. Jacopo Tintoretto (c 1518-1594), The Last Supper (E&I 145) (c 1571), oil on canvas, dimensions not known, San Simeone Profeta, Venice, Italy. Image by Sailko, via Wikimedia Commons. 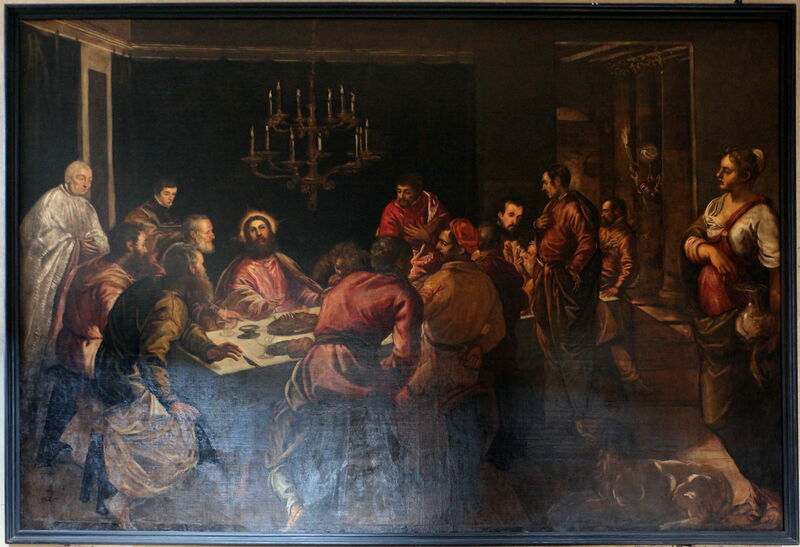 Tintoretto’s next painting of The Last Supper (E&I 145) was made in about 1571, for the Church of San Simeone Profeta (San Simeone Grande), and is every bit as original as the previous one. It is as informal in its composition and content, and it is quite hard to distinguish all twelve disciples: one is only seen by his face and hands, behind the figure standing by the right end of the table. Judas Iscariot is shown more conventionally, as the figure in yellow with his back to the viewer, just to the right of centre. He has his right hand behind his back, where it holds a small purse of silver. There are also a couple of people serving the meal, and the incongruous figure of a contemporary priest wearing a white cassock, at the left edge. At the lower right is a large dog. Jacopo Tintoretto (c 1518-1594), Saint Jerome (E&I 155) (c 1571-72), oil on canvas, 143.5 x 103 cm, Kunsthistorisches Museum, Vienna, Austria. Wikimedia Commons. Tintoretto’s small full-length portrait of Saint Jerome (E&I 155) from about 1571-72 is fairly conventional, although the saint here appears much younger and less ascetic than in most other paintings of him. He is surrounded by traditional attributes, including the head of a lion, his books, and the red cardinal’s hat at the right edge. 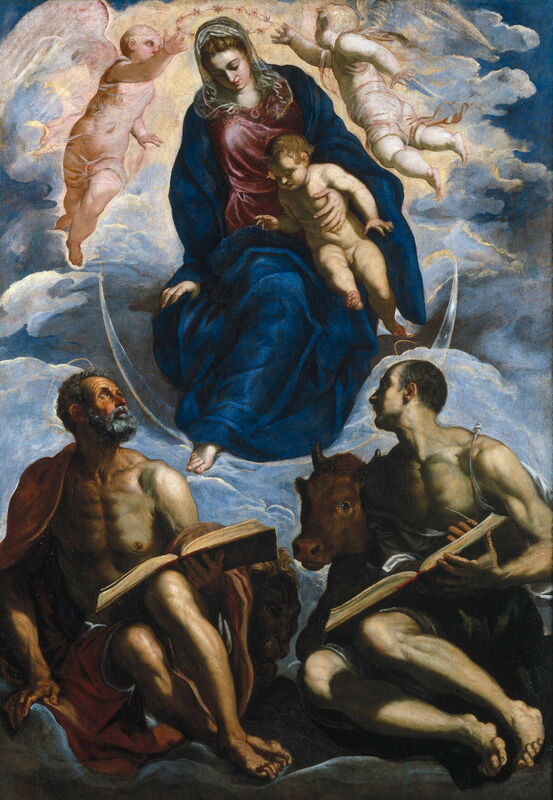 Jacopo Tintoretto (c 1518-1594), The Virgin and Child with Saints Mark and Luke (E&I 156) (c 1571-72), oil on canvas, 228 x 160 cm, Gemäldegalerie der Staatlichen Museen zu Berlin, Berlin, Germany. Wikimedia Commons. The Virgin and Child with Saints Mark and Luke (E&I 156) from about 1571-72 is another smaller painting which features particularly well-developed figures. 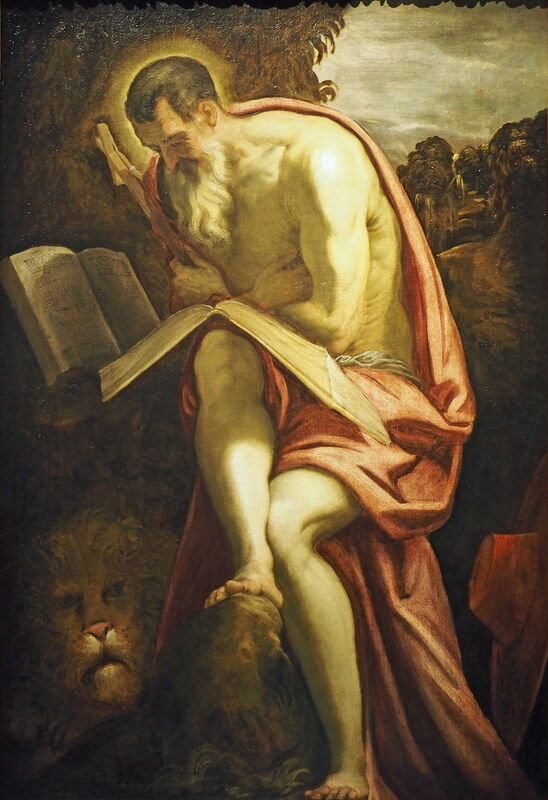 Saint Mark the Evangelist, the patron saint of the city of Venice, is at the left, and behind is his attribute of a lion. Saint Luke, at the right, is accompanied by his animal attribute of an ox. Jacopo Tintoretto (c 1518-1594), Doge Alvise Mocenigo (1507–1577) Presented to the Redeemer (E&I 157) (1577), oil on canvas, 97.2 x 198.1 cm, The Metropolitan Museum of Art (John Stewart Kennedy Fund, 1910), New York, NY. Courtesy of The Metropolitan Museum of Art. Tintoretto’s unfinished sketch for a much larger votive painting of Doge Alvise Mocenigo (1507–1577) Presented to the Redeemer (E&I 157), is thought to have been started in about 1571-72. The finished work was intended for the Sala del Collegio in the Doge’s Palace in Venice. Doge Mocenigo had ruled the city during a period of turmoil, including the great naval victory over the Turks at the Battle of Lepanto in 1571, and the devastating epidemic of plague in 1576, which killed Titian. Jacopo Tintoretto (c 1518-1594), Doge Alvise Mocenigo and Family before the Virgin and Child (E&I 158) (c 1572), oil on canvas, 216 x 416 cm, The National Gallery of Art (Samuel H. Kress Collection), Washington, DC. Courtesy of the National Gallery of Art. 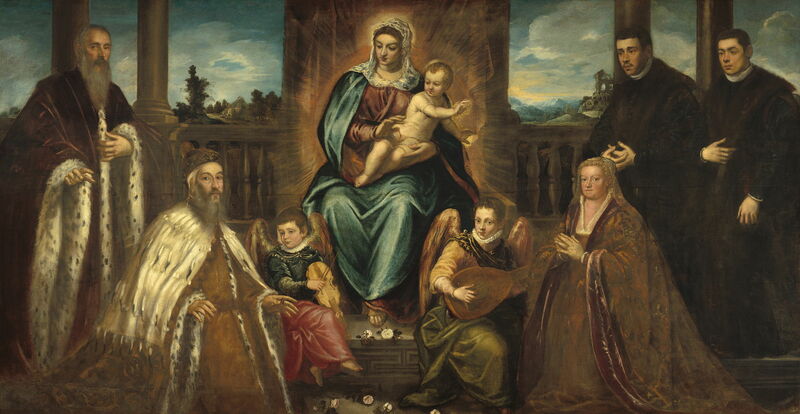 The votive which was painted by Tintoretto and his studio is Doge Alvise Mocenigo and Family before the Virgin and Child (E&I 158), from about 1572, and now in Washington’s National Gallery of Art. The setting is quite spectacular here too, with a detailed landscape view featuring snowy mountains (something Tintoretto seems never to have seen for himself) and a wonderful sky. Jacopo Tintoretto (c 1518-1594), Christ Washing the Disciples’ Feet (E&I 160) (mid 1570s), oil on canvas, 204.5 x 410.2 cm, The National Gallery, London. Wikimedia Commons. At some time in the mid 1570s, Tintoretto returned to the gospel narrative of Christ Washing the Disciples’ Feet (E&I 160), in this large canvas which is now in London’s National Gallery. While there it has undergone extensive conservation work, which enabled Joyce Plesters to undertake its detailed examination. The reason for its impenetrably dark appearance is that it was painted on a black ground, laid on a very thin coat of gesso. Tintoretto then sketched its underdrawing using white lead paint on top of the ground. Some passages, particularly in the drapery, consist of quite complex layering of paint, although most of the flesh was painted quite simply, using lead white tinted with ochre. Among the pigments found were: natural ultramarine, azurite, smalt (in some underpainting), malachite, copper resinate glaze, red lakes based on kermes, lac, and madder (in Christ’s robe), lead-tin yellow (Christ’s halo), orpiment, realgar, lead white, and carbon black. The drying oil used is linseed. Finally, in about 1574-75, Tintoretto painted another large Last Supper (E&I 162), this time for ‘San Polo’, the Chiesa di San Paolo Apostolo in Venice. For this, he has moved the scene almost out into the open air, and lowered the point of view. Oddly, he shows no less than fifteen adult figures in addition to Christ, and a young boy to the right. The emphasis here is on Christ giving the sacrament to the disciples, as he holds out broken bread to the two who are standing at the table. The classical landscape seen at the upper right leads up to a hill which could be intended to be the Mount of Olives, perhaps, and there is a dramatic sunset over rocks and waterfalls. Over the later 1570s, Tintoretto was to return to work for the Scuola Grande di San Rocco and the Palazzo Ducale, which I will look at in the next articles. Posted in General, Life, Painting and tagged history of painting, narrative, painting, Tintoretto, Titian, Venezia, Venice. Bookmark the permalink.